• You can’t find good people to work for you? • Your new hire isn’t delivering on what you expected? • Your managers were more effective? • You could leave your business and trust others to run it the same as you? • You understood how your colleagues and employees perceive your strengths and struggles? • Improve Hiring & Selection: The right person in the right job is priceless. The wrong one is a nightmare waiting to happen. Accurately identify job applicants BEFORE the interview, make scientifically informed judgements and build an organization of A+ employees. 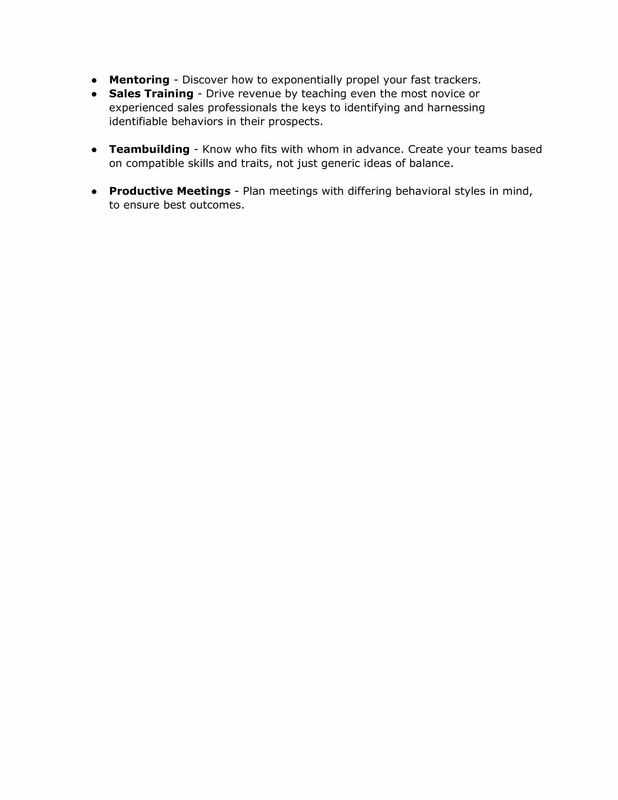 • Increase Sales: Teach your sales team powerful behavior profiling skills. Empower them to identify – to your organization’s advantage – observable behaviors, then adapt their selling style to fit the customer’s buying style. • Improve Customer Service: Know in advance that your people believe in your organization and care about your customers. Better equip and train your customer support team with the invaluable communication and behavior profiling skills that pay countless dividends. • Increase Productivity: Identify with scientific accuracy the strengths and shortcomings of each employee. Create observable action plans, from the data, that maximizes your organization’s talent. • Reduce Employee Turnover: Ensure the best possible positional job “fit” for each new hire. Great fit means stronger retention rates, which lowers the costs associated with turnover. • Customize Employee Training: One size fits ONE, not all. Learn how each person learns best and get them back to productivity sooner. • Model Team Building: Know who fits with whom in advance. Create your team based on compatible skills and traits, not just generic ideas of balance. Top-level teams are comprised of behaviorally compatible members with an optimal array of complimenting proficiencies. With the emergence of .com job searches, it has become hugely challenging for businesses to find (and keep) qualified and talented people. The emergences of web-based job search resources have helped create a fluid workforce capable of constantly searching for that next perfect job. According to the International Management Association, average churn rates have jumped by more than 14 percent in just the last decade — and that number continues to climb. Employers can combat this trend — while saving both time and money — by enlisting online assessments to accurately qualify job applicants, build "A" teams for special projects, determine informed promotions, identify communication deficits and more. Simply stated, quality, science-supported online assessments can ensure that a company eliminates risk while optimizing its greatest potential attribute: human capital. Assessments work by measuring a variety of criteria: intellectual ability, achievement motivation, skill proficiency, work styles, personality characteristics, and personal values. Assessments are a first step toward establishing a solvent bedrock of talent for any company. Likewise, our assessments give employees an opportunity to learn something about themselves, with the goals of self-improvement, personality enrichment and enhancement of their workplace relationships. We offer assessment tools where there are no apparent "right" or "wrong" answers. Employees participate freely because they know they will not pass or fail, but merely increase the likelihood of their own professional happiness. A good assessment is designed in-part to increase employees' awareness of their behavioral tendencies in relation to how they interact with others. Our assessment systems come with support materials and action plans to help employees and management maximize positive outcomes. Quality assessments are malleable, capable of optimization for the complete professional spectrum: customer service, vocational, technical, sales, management or executive. It's important for employees to have the necessary skills to demonstrate the attitudes and behaviors that would enable them to succeed within each company's unique environment. • Communication Skills - The art of using words effectively to impart information or ideas in ways that resolve conflicts. Conducts constructive meetings. Expresses facts and ideas in an understandable and convincing manner. Listens well and considers other’s opinions before coming to conclusions. Does not interrupt others. Master of self-awareness and self-management in coping with stressful situations. • Decision Making - The process by which one consciously selects of a course of action, among available alternatives, based on the best information available. Enacting decisions in a timely manner appropriate to the challenge at hand. Characteristics of good decision-making include influencing others through a wise course of action, carrying through on the course of action identified, and sound logic. • Promotes Innovation and Change - To create a work environment that encourages creative thinking and justifiable risk-taking. Being open to change and new information. Adapting behavior and work methods in response to new information, tolerating ambiguity, changing conditions, or unexpected obstacles. Identifying opportunities to develop new products and services. • Working Relationships - Creates an environment that encourages input and feedback by attentive listening. Positive responses and openness to alternative concepts by valuing diversity of ideas and cultural differences. Fostering an environment in which people can work together cooperatively and effectively in achieving organizational goals. Establishing and maintaining good working relationships with direct reports, peers, supervisor, and outsiders, as well as internal organizational units. • Leadership Skills - Creates a vision or goal for one’s work unit and communicates it in a way that motivates others to implement it. Empowering people by sharing authority and delegating responsibility. Actively builds staff’s trust and commitment by mentoring, fostering good working relationships, and acting selflessly and with integrity. • Coaching Skills - Seeks out the very best of "what is" in others to help ignite "what might be." Helps people clarify their career goals and actively develop skills needed to achieve those goals. Continually challenges people to improve performance, while providing frequent and helpful development discussions and feedback. • Utilizes The Strengths of Others and Self - Efficiently focuses energy on developing and using the strengths of him/herself and others (versus a smaller portion of time trying to overcome shortfalls). Leaders still have to work on strengthening their shortfalls, particularly those that have a significant impact on productivity. • Team Development - Demonstrates the ability to influence a group of diverse individuals, each with their own goals, needs, and perspectives, to work together effectively for the collective good. Insures that team members understand their roles and responsibilities, while encouraging mutual accountability for successes and failures. Works cooperatively with other parts of the organization by building trust, creating synergy, and recognizing successes. • Are you an upper-level leader or executive? Immediately reassess the leadership qualities that brought you to your current position. • Are you a supervisor or mid-level leader? Identify your current strengths and those areas where you need to improve. • Are you a new and developing leader? You will have a clear set of guideposts on which to base your growth. • Preparing for the sale and preparing yourself. You can be well prepared with information and sales tools, but if you are not in the appropriate frame of mind, or if you do not appear professional to the buyer, you might not get the sale. • Targeting explores the markets or groups you may target as prospective buyers. Then, we focus on the individuals with whom you will make contact. This includes the sales strategies and tactics you select for each target market. Poor targeting with great selling skills would result in limited success because you would be selling to the wrong people. • Connecting is the initial sales contact step, where you must appeal to people intellectually so they will see you as a credible resource, and emotionally so that they will trust you as a person. Without either, you are inhibited from learning enough about them to solve their problems and make a sale. • Solving the buyer’s problem, or filling their need, is where most of the sales attention has been placed in the past. This is the part where you present your solutions, tell your stories, demonstrate your product or describe the outcomes that buying will produce. At its lowest level, this is a sales pitch. At its highest level, this is a dialogue where you prove there is great value for them in buying from you. • Confirming is the sales phase where you gain the prospect’s commitment to buy. Confirming is achieved only after you have shown the ability to solve the prospect’s problem. Historically, this has been known as “closing” the sale, but the truth is that it is not an end, but the beginning. It is at this point that the sales professional begins serving the customer and they, in turn, begin paying for the value they receive. • Assuring clients that the value promised will be received is critical to customer retention. This is where relationships are built and customer loyalty is to be given (by you) more than expected (from them). 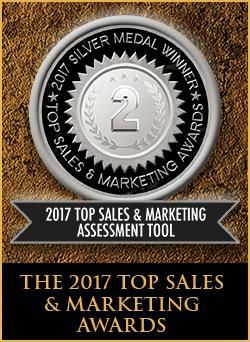 • Managing is the final phase of the sales cycle, where you manage sales and accounts and self-manage yourself. Ultimately, we are all our own ‘sales manager’. This is the phase of selling where you must make yourself do what needs to be done, even when you do not feel like doing it. Like-wise, business leaders are better equipped to make informed personnel decisions when they understand what galvanizes each new job applicant or team member. Steadfastness, attention to detail and accuracy aren't issues for someone whose motivations align well with the values necessitated by a particular job. The Motivators assessment identifies seven potential "drivers" of motivation which exist in everyone, to varying levels. By taking detailed measurements of these seven key impulses, the Motivators assessment is able to offer the practical applications and insights necessary to maximize performance and project outcomes. • Aesthetic - a drive for balance, harmony and form. • Economic - a drive for economic or practical returns. • Individualistic - a drive to stand out as independent and unique. • Political - a drive to be in control or have influence. • Altruistic - a drive for humanitarian efforts; help others altruistically. • Regulatory - a drive to establish order, routine and structure. • Theoretical - a drive for knowledge, learning and understanding. This assessment uses a click-and-drag approach to ranking the various statements in the instrument, which allows the process to be more intuitive and natural. In the end, you can actually create the order you see in your mind on the screen. To ensure the most accurate and relevant results possible, The Motivators Assessment is updated regularly to contain the most contemporary list of statements and associations. Aesthetic: The aesthetic person sees the highest value in form and harmony. Each experience is judged from the standpoint of grace, symmetry, or fit. He regards life as a procession of events; each event enjoyed for its own sake. He need not be a creative artist, nor need he be decadent; he is aesthetic if he but finds his chief interest in the beauty of life. Altruistic: The highest value for the altruistic person is love of people. In this dimension, it is the altruistic or philanthropic aspect of love that is measured. The altruistic person prizes other persons as ends, and is therefore herself kind, sympathetic and unselfish. She is likely to find the theoretical or economic attitudes cold and inhuman. In contrast to the political type, the altruistic person regards love as itself the only suitable form of human relationship. Economic: The economic person is characteristically interested in what is useful. Based originally upon the satisfaction of bodily needs, (self-preservation,) the interest in utilities develops to embrace the practical affairs of the business world in the production, marketing and consumption of goods, the elaboration of credit and the accumulation of tangible wealth. This type is thoroughly practical and conforms well to the prevailing stereotype of the businessperson. More than perhaps any other, the economic attitude frequently comes into conflict with other values. The economic person wants education to be practical, and regards unapplied knowledge [often sought by the theoretical person] as waste. Great feats of engineering and application result from the practical demands economic people make upon science and theory. The value of utility likewise conflicts with the aesthetic value, except when art serves commercial ends. In his personal life, the economic person is likely to confuse luxury with beauty. In his relations with people, he is more likely to be interested in surpassing them in wealth than in dominating them (political attitude) or in serving them (altruistic attitude). In some instances he may have regard for the regulatory attitudes, but inclines to consider it as a means to rewards of wealth, prosperity, and other tangible blessings. Individualistic: The individualistic person seeks to be separate and independent. Her desire is to stand out, to express her uniqueness and be granted freedom over her actions to champion her own bearing. Unlike the political attitude, the individualistic person seeks neither power nor control of others or the environment in general. She is only concerned with controlling her own fate and protecting her own sovereignty. The individual person rails against his subjugation by any external force, and when she feels so, her only focus becomes her own emancipation. Political: The political person is interested primarily in power and control. His activities are not necessarily within the narrow field of politics, but whatever his vocation, he betrays himself as a Machtmensch (i.e., control freak.) Leaders in any field generally have high power and control values. Since competition and struggle play a large part in all life, many philosophers have seen power as the most universal and most fundamental of motives. There are, however, certain personalities in whom the desire for a direct expression of this motive is uppermost, who wish above all else for personal power, influence and renown. Regulatory: The highest value of the regulatory person may be called unity. She is mystical and seeks to comprehend the cosmos as a whole and to relate herself to its embracing totality. The regulatory person is one whose mental attitude is directed toward achieving structure, and is permanently directed to the creation of the highest and absolutely satisfying value of order and constitution. Some of this type finds their life’s value in the affirmation of life’s systems or processes, and in active participation therein. The ‘traditionalist’ seeks to unite herself with a higher order to be one with the system. Theoretical: The dominant interest of the theoretical person is the discovery of truth. In the pursuit of this goal, he characteristically takes a ‘cognitive’ attitude; one that looks for identities and differences; one that divests itself of judgments regarding the beauty or utility of objects, and seeks only to observe, reason and understand. Since the interests of the theoretical are empirical, critical, and rational, he is necessarily an intellectualist, frequently a scientist or philosopher. His chief aim in life is to gain, order and systematize his knowledge. The ATTENDING category looks at an individual's motivation to learn in the first place, and the levels of commitment or concentration they tend to give when new information is presented to them. This category has two sub-scales: "Telescopic" and "Wide-angled". Telescopic means they are generally effective at concentrating and keeping their mind on the information being shared without worrying about the physical context. Wide-angled means the individual is often easily affected by environmental factors such as noise, low light and other physical influences that can easily interfere with any information being shared. The TRANSLATING category looks at whom an individual relies on most in managing the transfer of learning, and in making sense of what they see, hear, or sense. This category has three sub-scales: "Dependent", "Collaborative", and "Autonomous". Dependent means the individual mainly favors relying on the trainer or facilitator for information. Collaborative means the individual mainly favors relying on group discussions or team activities for learning. Autonomous means that self-reliance is favored in personally managing the learning transfer process. The UNDERSTANDING category looks at an individual's preferences for synthesizing data or information they receive. This category has two sub-scales: "Global" and "Analytical". Global means a preference for understanding at a conceptual or "big picture" level. Analytical means a preference for understanding at a detailed or step-by-step level. By combining our robust DISC and Emotional Intelligence assessments, we’re effectively pairing two of the world’s most powerful behavioral instruments into a single tool. Users receive an objective analysis coupling their innate behavioral style (via DISC) with their learned emotional IQ style (via EIQ-2). 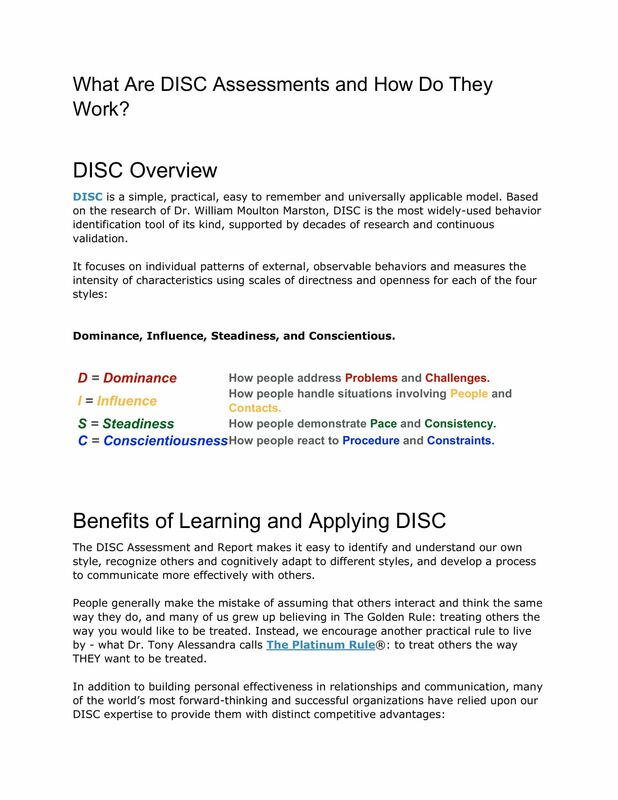 In simplest terms, DISC is an invaluable behavioral profiling system that teaches users how to identify— and use to their advantage— the predictable aspects of communication. 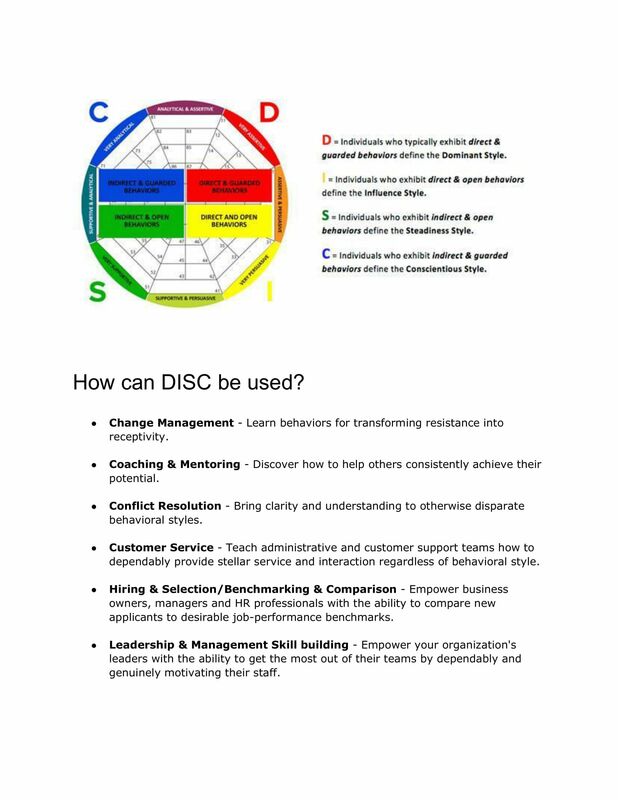 Based on the research of Dr. William Moulton Marston, DISC is the most widely-used behavior profiling tool of its kind, supported by decades of research and continuous validation. Its relied upon by individuals and organizations around the world to drive improved performance and increase productivity across a variety of settings and professional frameworks. 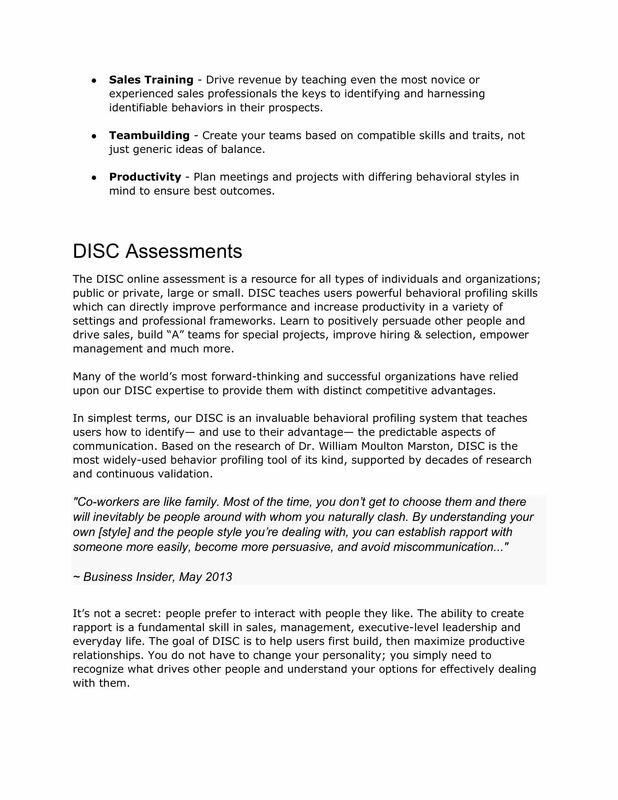 The DISC behavioral style is only one element within a working relationship, but it is one of the most crucial, as it defines how individuals interact and communicate with each other, which is critical to the success of any workplace effort. In any dual relationship, each individual has their own distinct way of doing things. 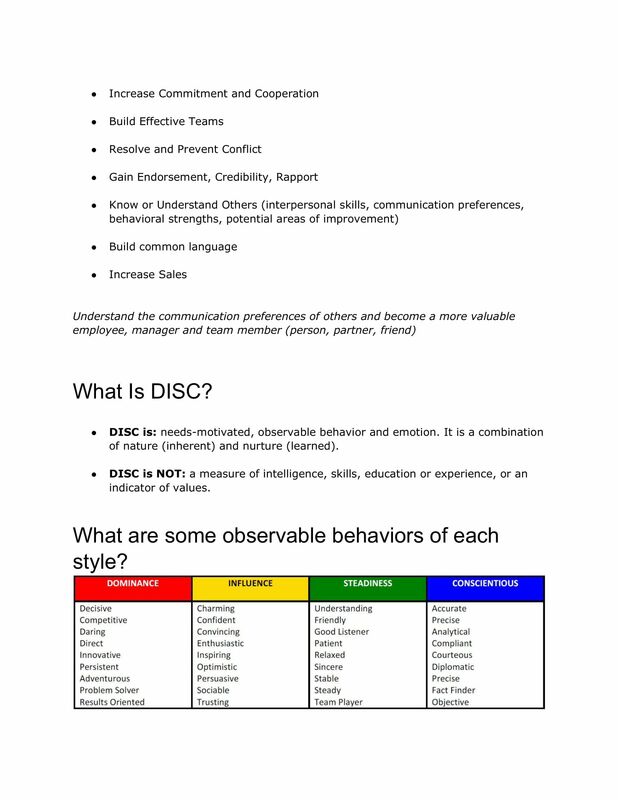 Used proactively during team-building and employee selection processes or in response to interpersonal conflict, the DISC Collaboration Report consolidates all of the important aspects of each unique interrelationship. • 1. 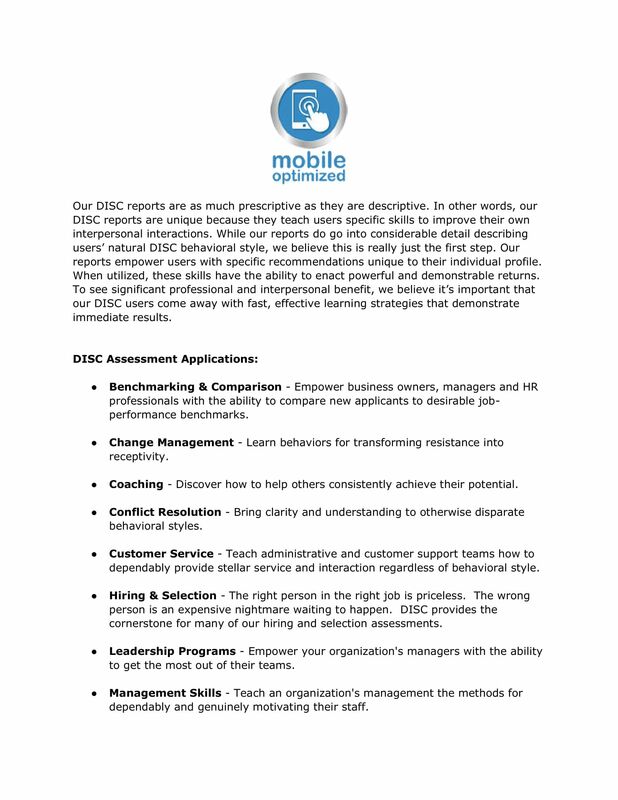 Leverage our existing library of benchmarks: The DISC Fitness Benchmark System starts you with a selection of general, occupationally-focused benchmarks for common positions like outside sales, operations manager, or even CEO. • 2. Create custom high-performer benchmarks: A great way to predict future success is to assess your current high performers using DISC. Our system automatically creates a benchmark for you based on the style strengths of your best employees – ensuring you a shorter path to success and retention. • 3. Use our job-needs questionnaire: This system-generated benchmark is created by asking stakeholders (current employees, immediate supervisors, and human resources professionals) a series of job related questions in order to produce a benchmark that is most likely to capture the characteristics of a successful job candidate. • 4. Create custom benchmarks from multiple sources: All of our system capabilities are fantastic, but sometimes a combination of each can produce the most valuable benchmark of all. Utilizing the tools, and making additional adjustments with even more job performance data can take your benchmarks – and thus your hiring practices – to even greater heights. The fitness rating is scored on a scale between 1% and 100%. The fitness rating represents the strength of the relationship between the candidate’s behavioral style and the behavioral requirements of a specific job or benchmark. The higher the fitness rating, the greater the ability for the candidate’s natural behavioral style to be applied to the task of getting the job done. Please contact us today! We can help you implement these exciting system features and reports. You no longer need to spend hours, days or weeks interviewing and selecting new hires based solely on first impressions.